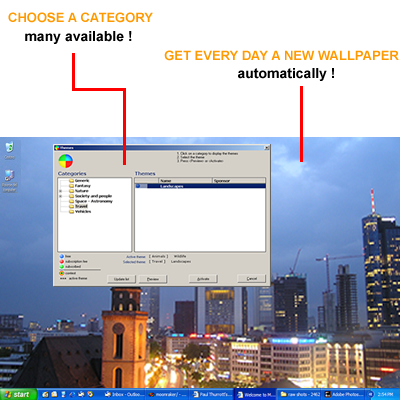 STRAYK is a freeware program that downloads automatically a new wallpaper for your desktop every day. CATEGORIES AND THEMES: An increasing number of themes will make it easy to select a theme of your choice. UPLOAD: You can also contribute by sending your creations (photos etc.) you want to show to a broad public. They will be made available for download in an appropriate category. SCREEN SAVER: Optionally, a screensaver can be activated showing all the saved wallpapers in a slide show. CONTESTS: Some themes are linked to contests, e.g. photo contests. You are free to participate and win beautiful prizes. ==== END-USER LICENSE AGREEMENT for STRAYK ====== IMPORTANT - READ CAREFULLY: do not install this software before you have read this license agreement. By proceeding to install this software you are indicating your acceptance of all the terms and conditions stated in this agreement. This is a legal agreement between you (either as an individual or a single entity) and STRAYK.